This guide aims to give support to anyone in England or Wales who is having difficulties in relation to health, social care or other support services. This guide aims to give support to anyone in Scotland who is having difficulties in relation to health, social care or other support services. This factsheet explains what you can do if your family has been assessed by social services, but you still aren’t getting the support you need. 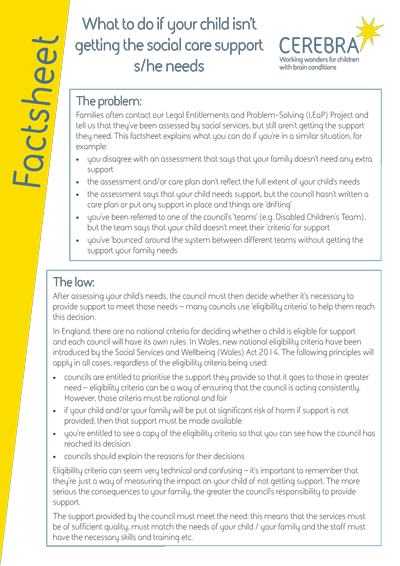 This factsheet explains what you can do if you’re unhappy with the way your council has changed or reduced your child’s care package. We have published guides for parents on a range of topics, including education and social care, that aim to provide useful information and practical advice. Our student researchers at the University of Leeds have published reports on some of the common themes arising from cases referred to our Legal Entitlements and Problem-Solving (LEaP) Project.